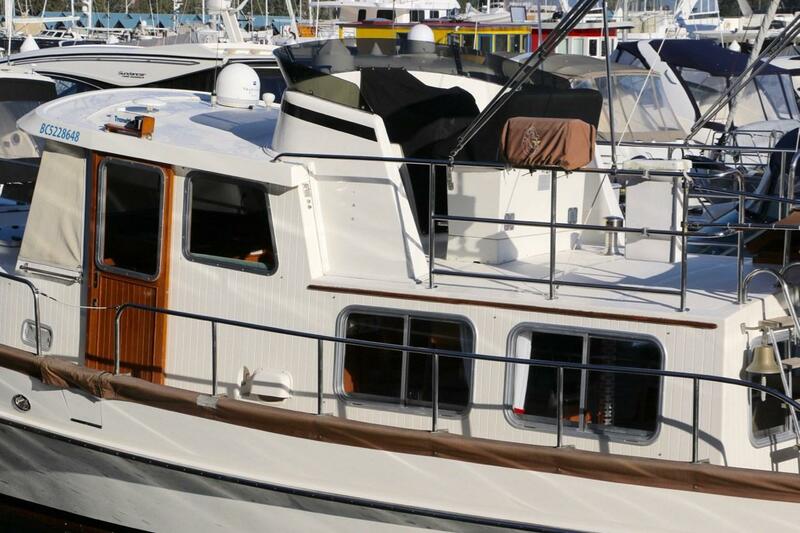 Decidedly handsome, and with a graceful sheer and engaging low profile, the Eagle 40 pilothouse trawler catches the eye wherever she ventures. 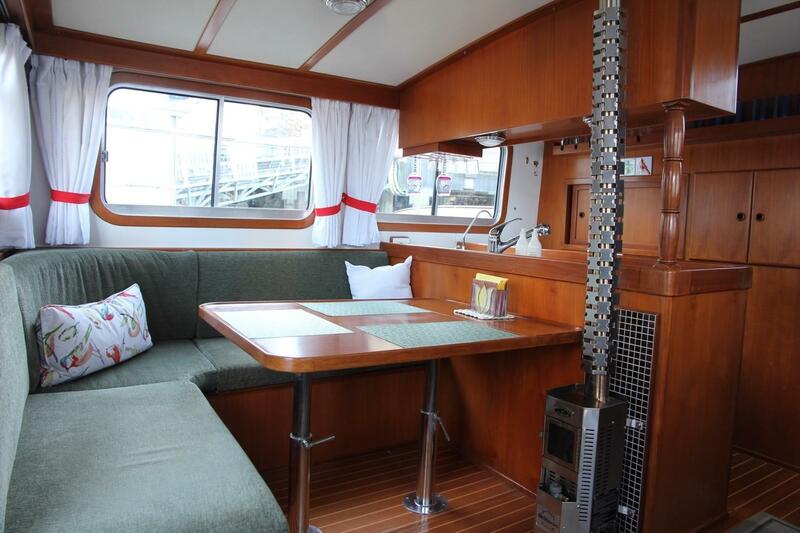 With a design as classic and sensible as this - a 40’ raised pilothouse with salty poise - deserves to explore our waters as if it was built solely for use here. 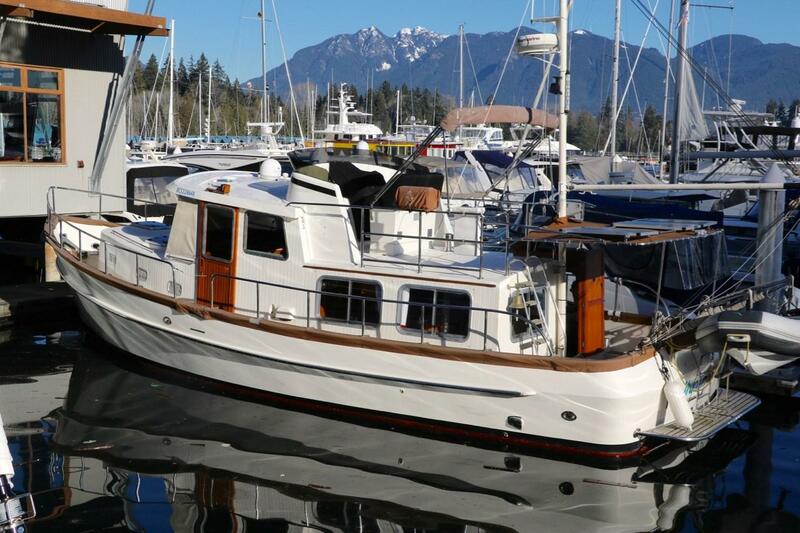 Designed to take a sea, any crew shall feel the confidence and stability of this proper yacht underfoot; perhaps while working its way through a sea around Cape Scott en route to Winter Harbour. 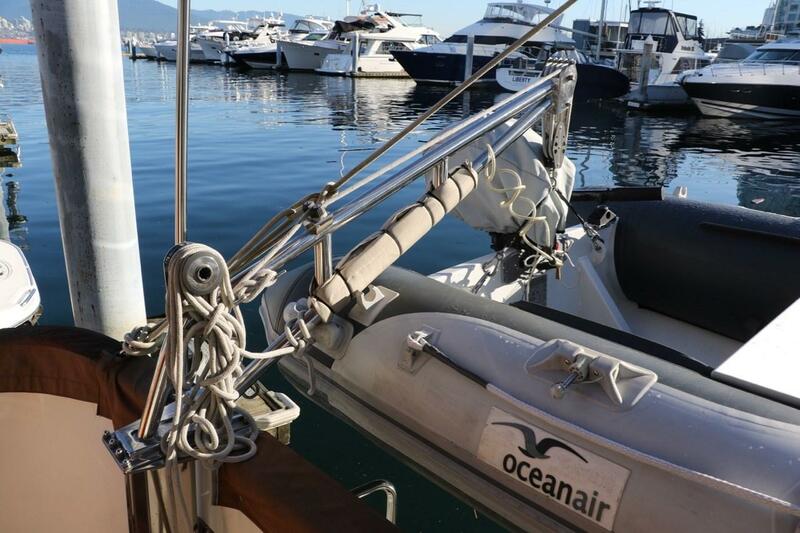 The hull is a semi-displacement design, with a generous beam and flat sections aft, the deep keel combines with the low center of gravity to stabilize and, when occasion demands it, to take advantage of the power of the 225hp Perkins engine. Transition is comfortable. 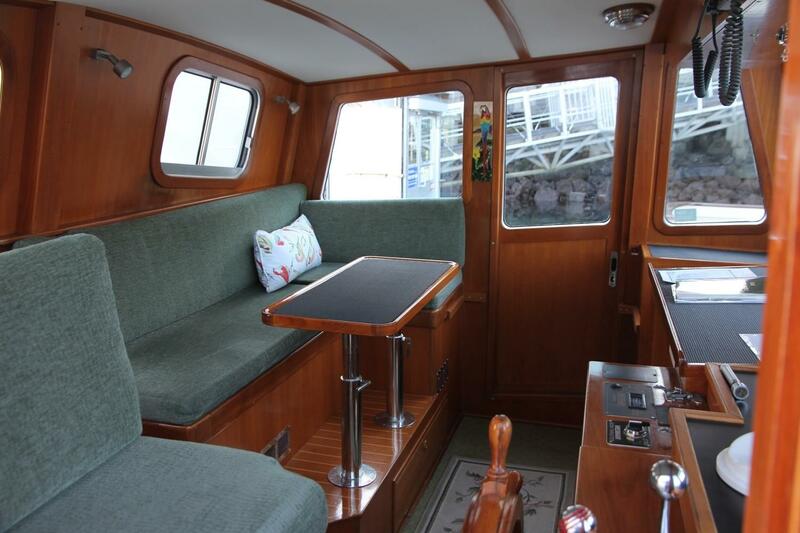 With ease of boarding through side gates either side of the wheelhouse; a deep, snug covered cockpit for summer evenings at anchor; a simple, functional upper helm (spacious, as the tender is mounted on the stern) to enjoy fine days underway; safe side decks to move around the boat; and, the pride of a finely finished interior are features all about comfort! 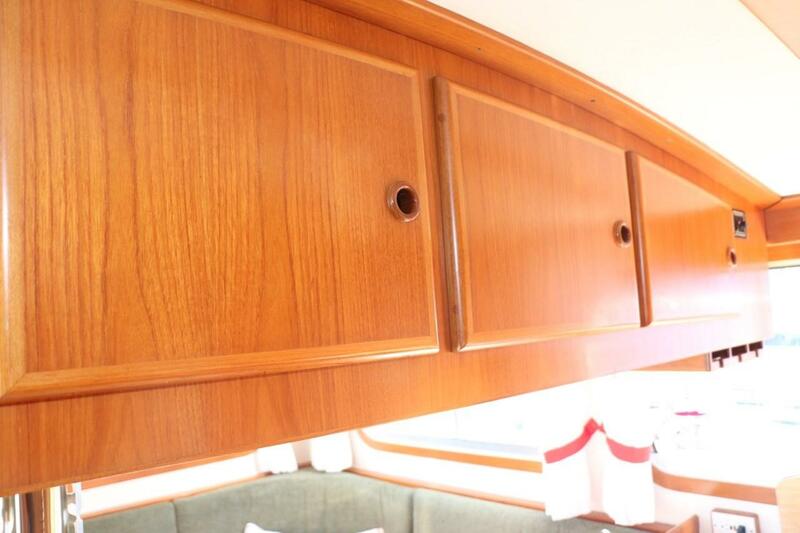 The teak joinery is in excellent condition - indeed, the vessel shows little wear and a great deal of care throughout. 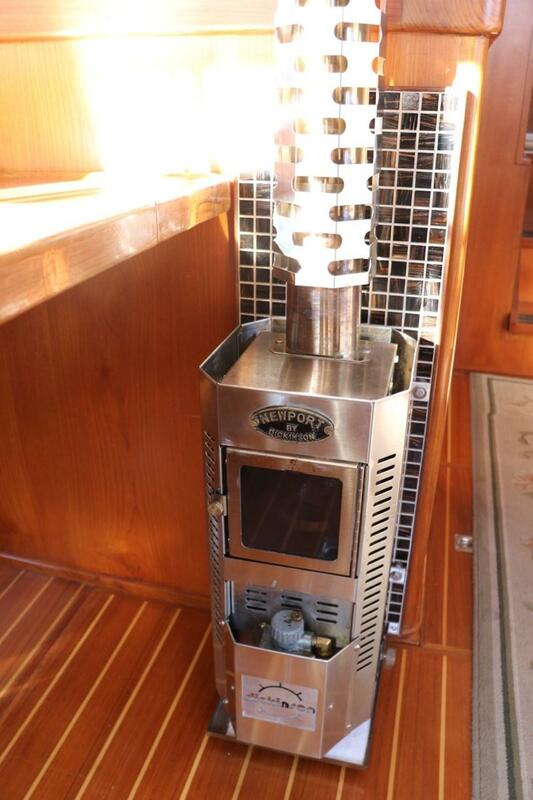 Cruisers will enjoy the comfort of the diesel space heater in the salon and hot air furnace serving the accommodation area down forward as they extend the cruising season or head north. 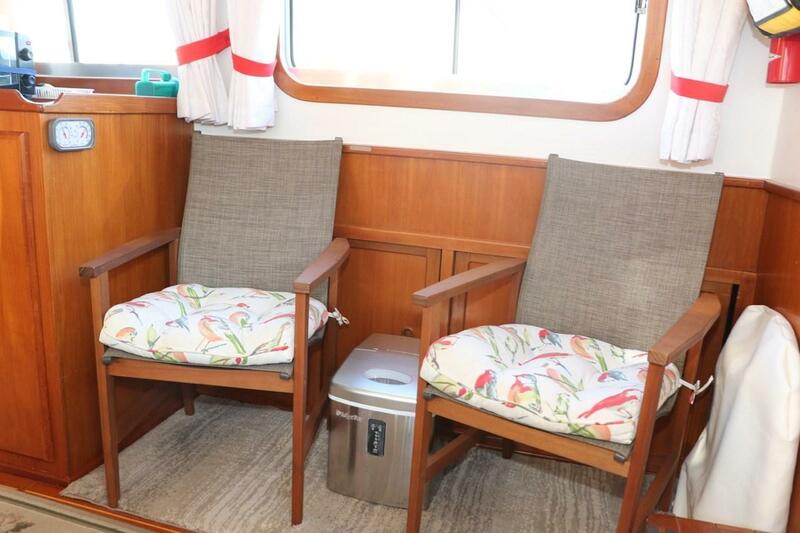 With settee and chair salon seating, large windows, and more than ample galley makes for a homely, comfortable interior space. 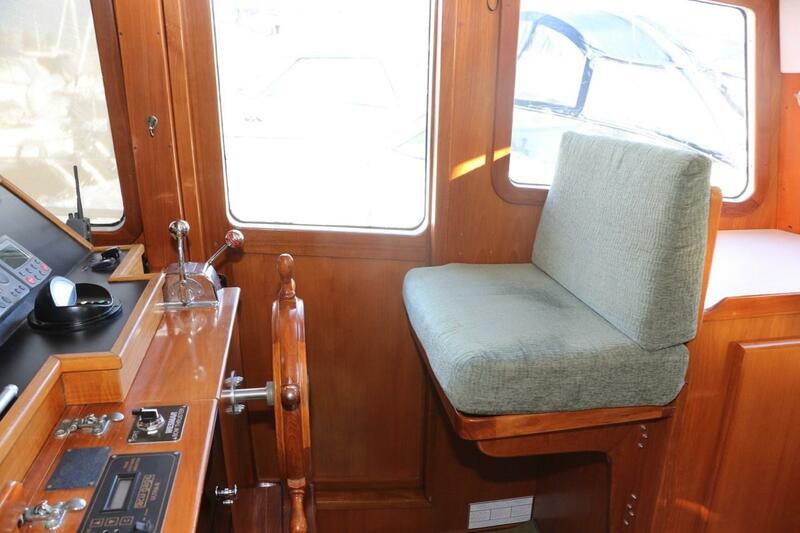 The pilothouse with helm seat and a generous settee is a wonderful breakfast vantage point, while offering a commanding view when underway. 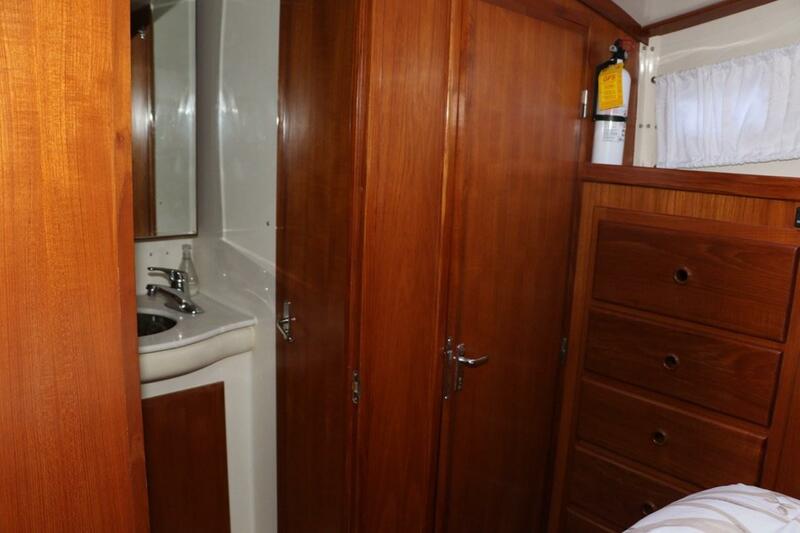 The accommodation area forward is surprisingly spacious with a generous island berth and head with separate shower stall. 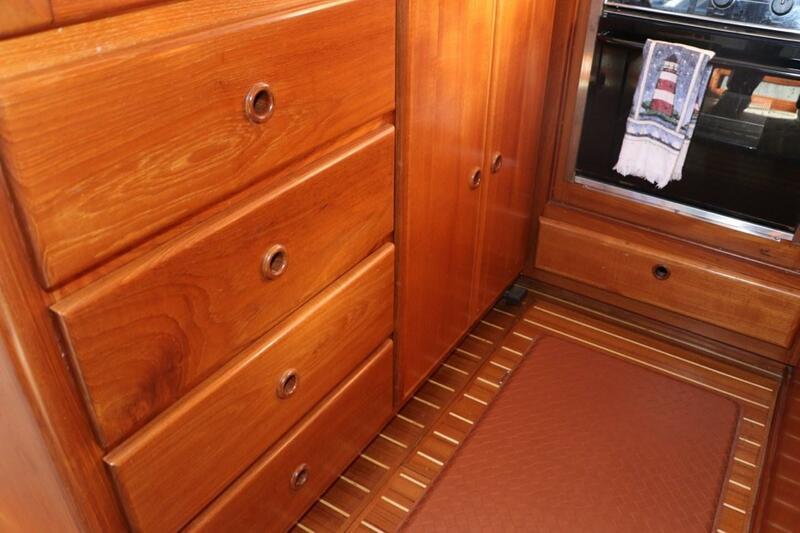 The serious or more adventurous cruiser will appreciate the outfitting and owner history of Transition. 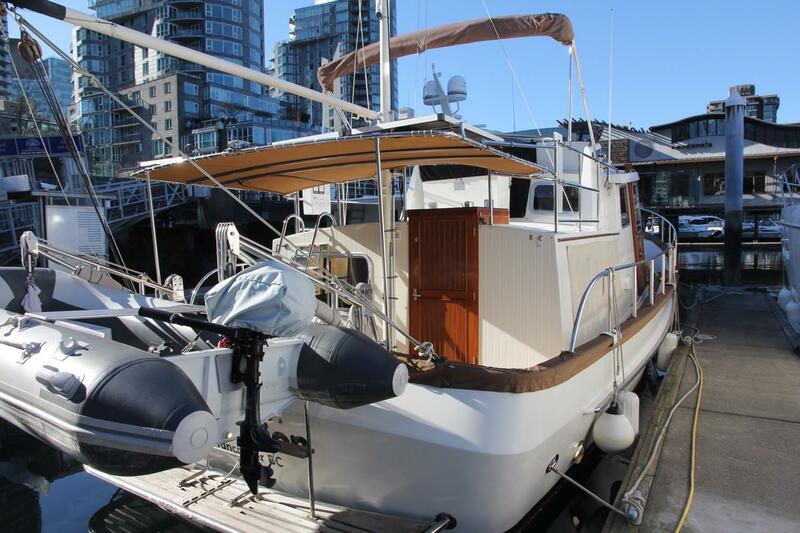 The engine choice - the redoubtable Perkins 225 - will power through tide and current, or throttle back to a quiet and steady 2 gallons per hour economic cruising speed. 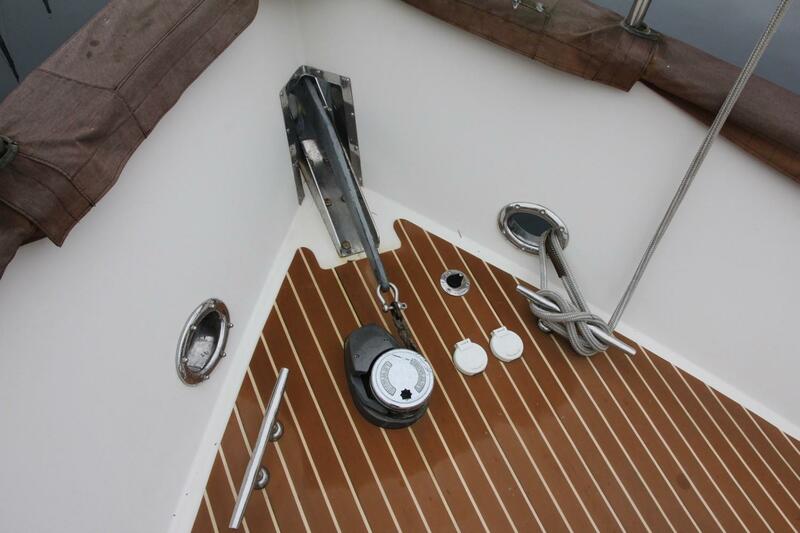 The powerful bow thruster - a size usually found on 50' boats - will easily control the bow in any circumstance. A Northern Lights generator provides expansive power. 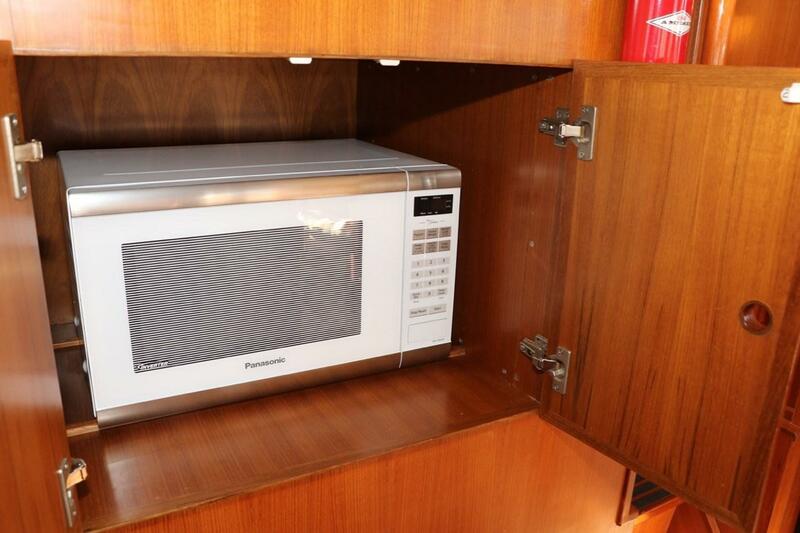 All these features add value in ownership. 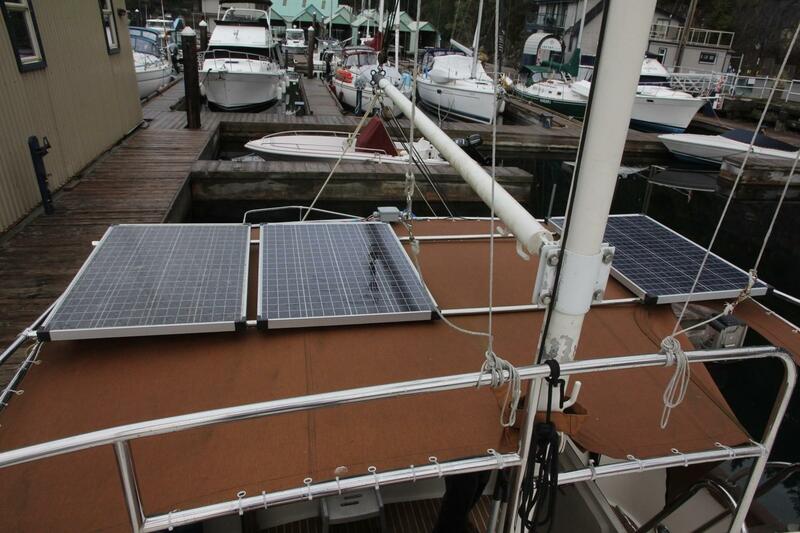 How many 40’ boats have a fuel polish and transfer system? Water purifier? 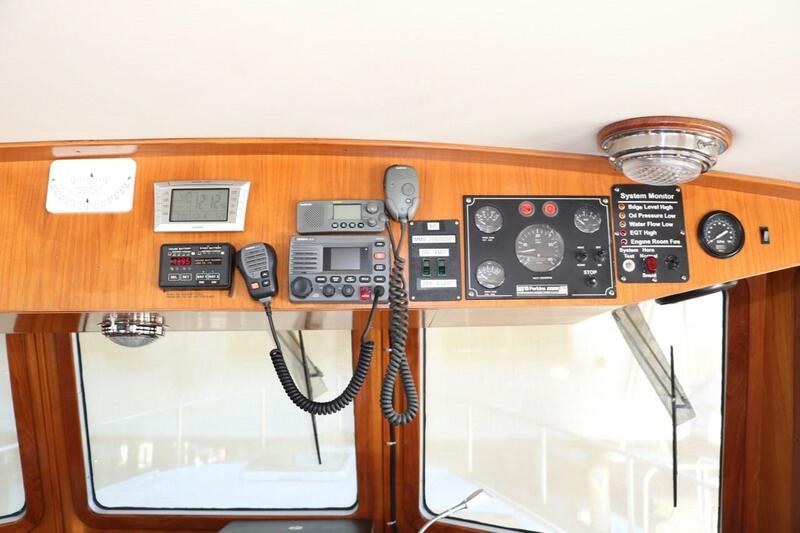 Redundant navigation systems? Solarpanels? PlasTek main decks? 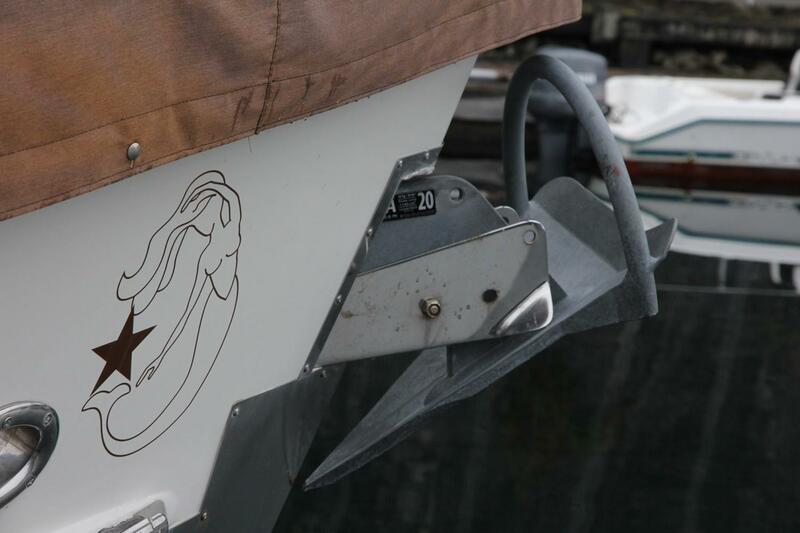 New tender and Stainless Steel davits? Complete operations manuals and maintenance records. 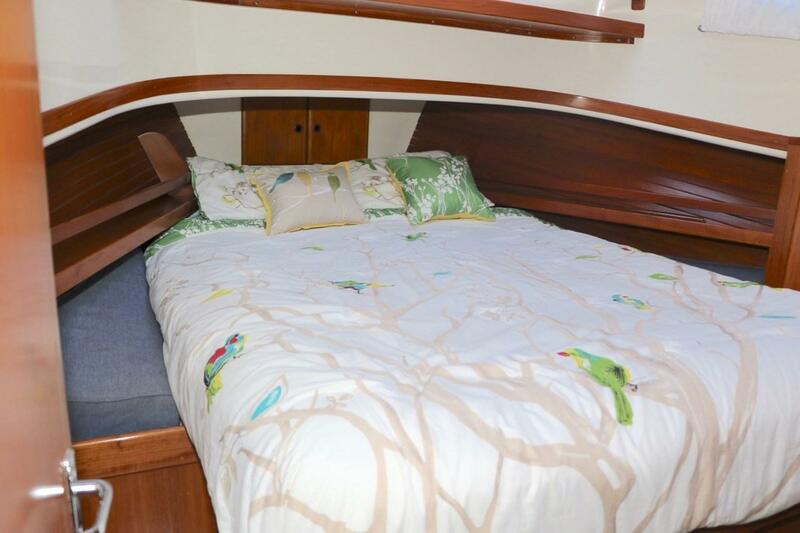 The previous owner was an airline pilot; the current owners are seasoned offshore sailors. 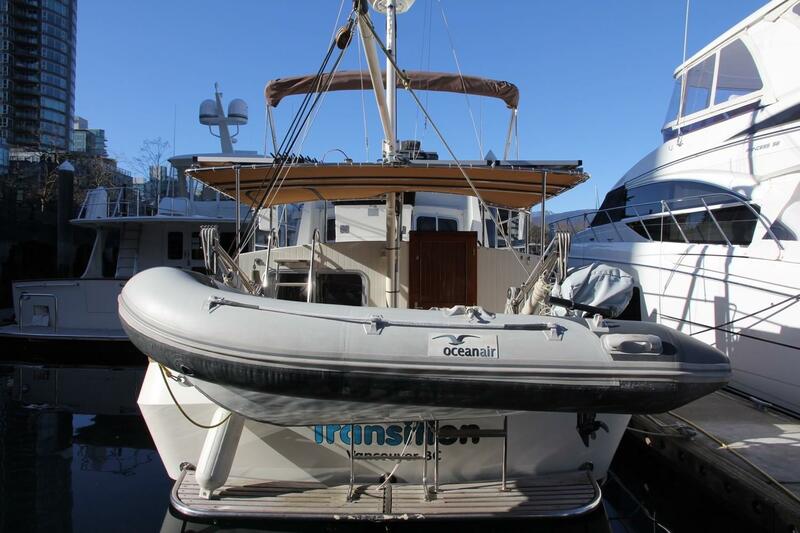 Transition is truly a proper yacht. 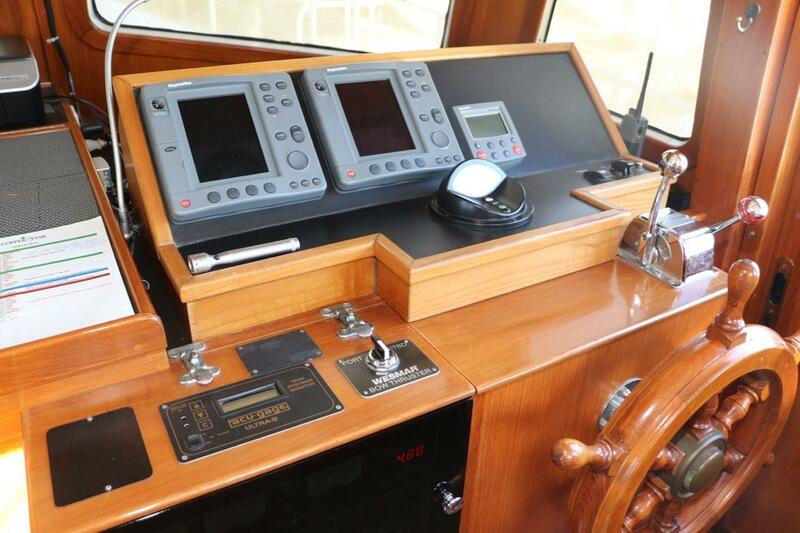 Transition features a traditional pilothouse layout, utilizing her generous beam to the fullest. 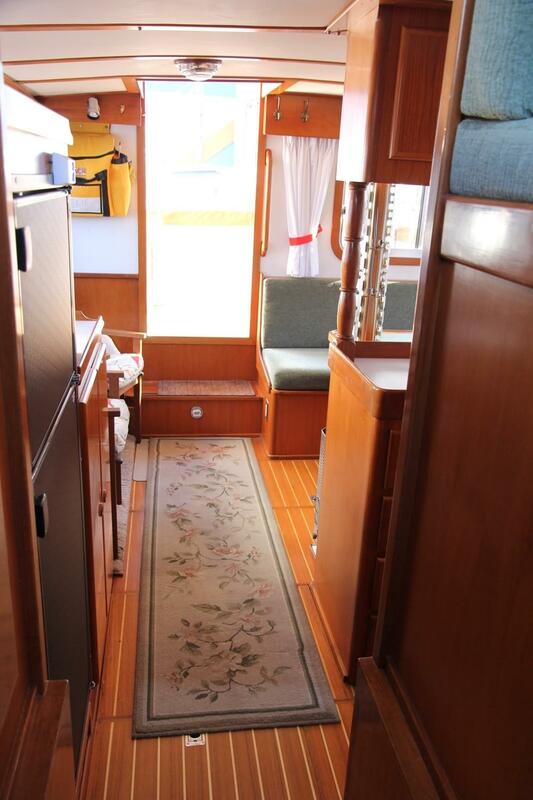 Even with safe walk around side decks, each space - the flybridge, cockpit, salon, galley, pilothouse and sleeping cabin - is very liveable, balancing needs for living, entertaining and cruising. 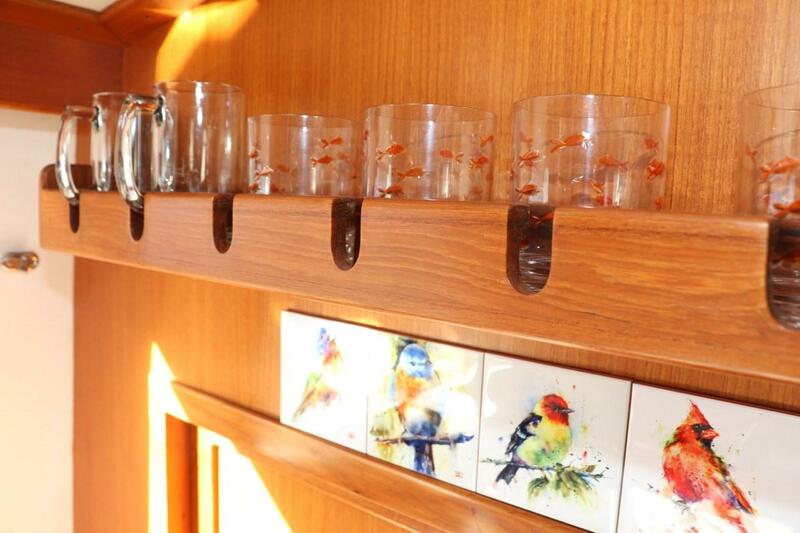 The design is ideal for a cruising couple with occasional guests. 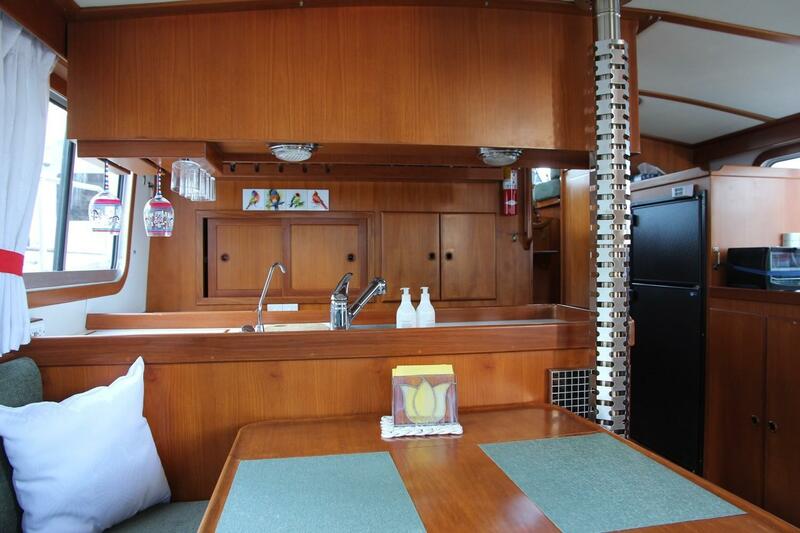 From the side decks, enter either pilot house door, or, from the cockpit, down two steps into the salon and galley. The salon features two occasional chairs across from a large dining table and an L-shaped settee. 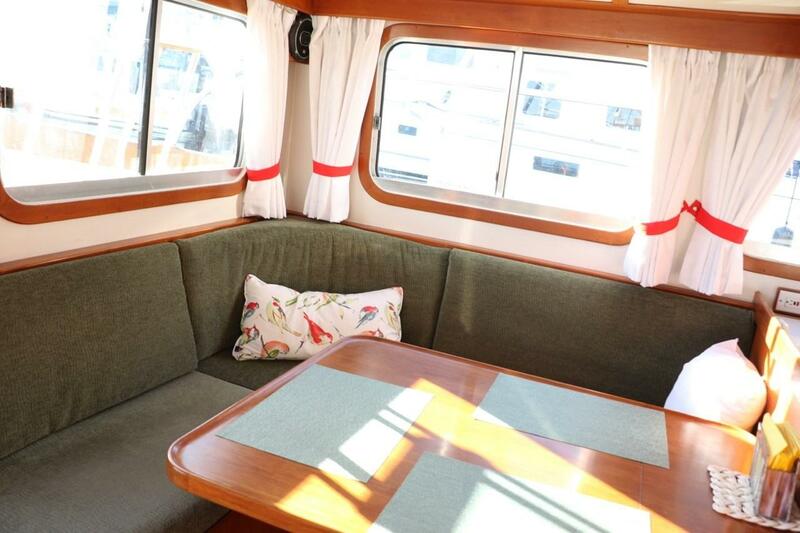 The table converts into a double berth for family or guests. 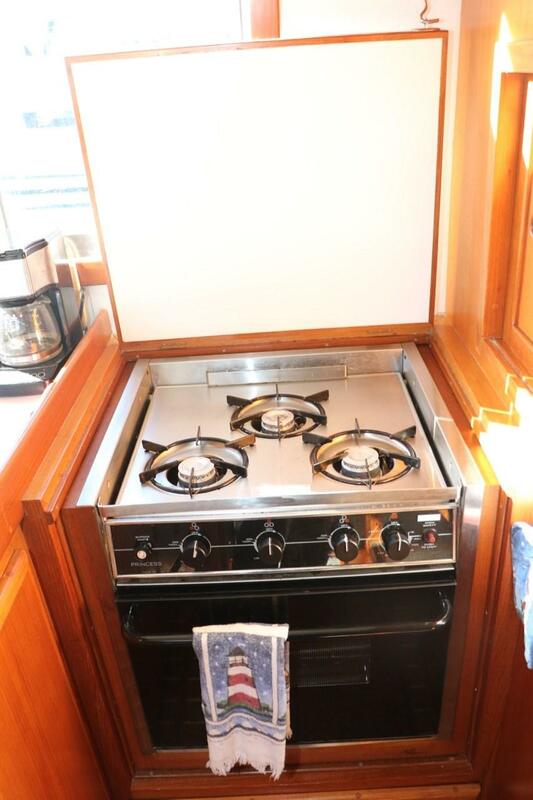 The Dickenson diesel fired space heater delights with a visible flame, and a deep warmth. 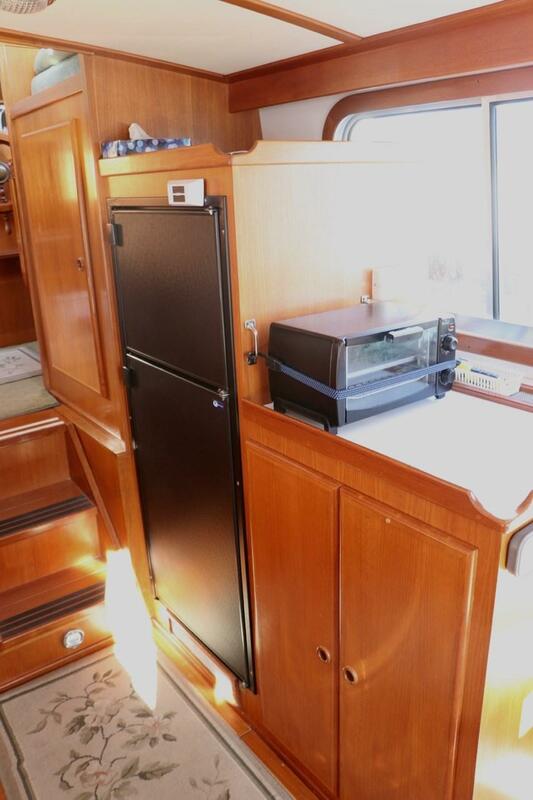 The galley forward, is separated by overhead lockers and a long counter with extensive storage. 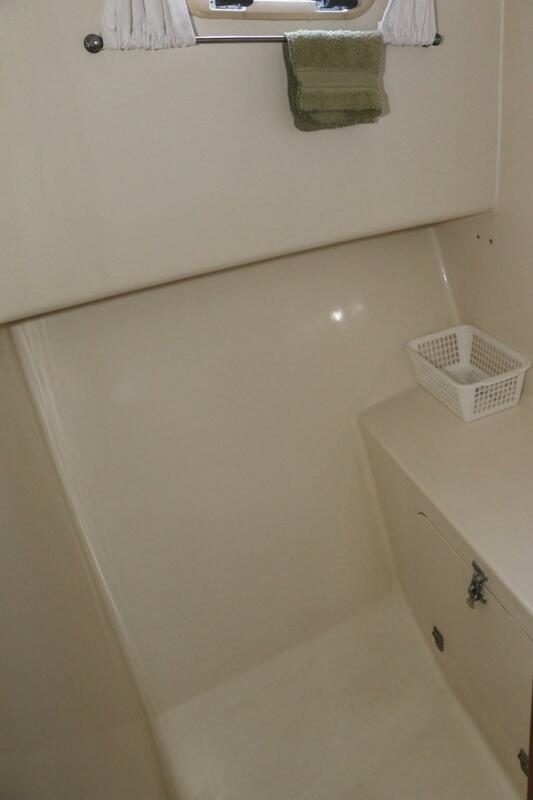 Note the microwave hidden in a locker, the fridge and freezer on the starboard side along with a large storage locker, plumbed and wired for a washer/dryer unit. 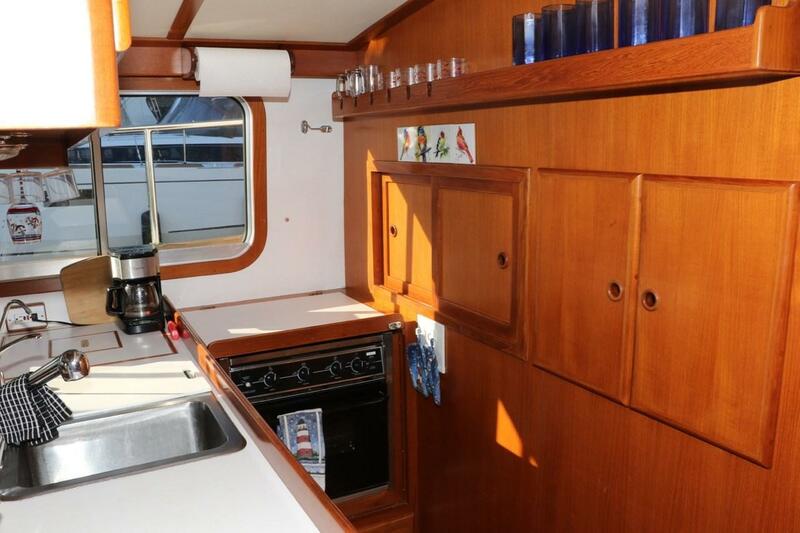 The galley is a study in storage and efficient space. 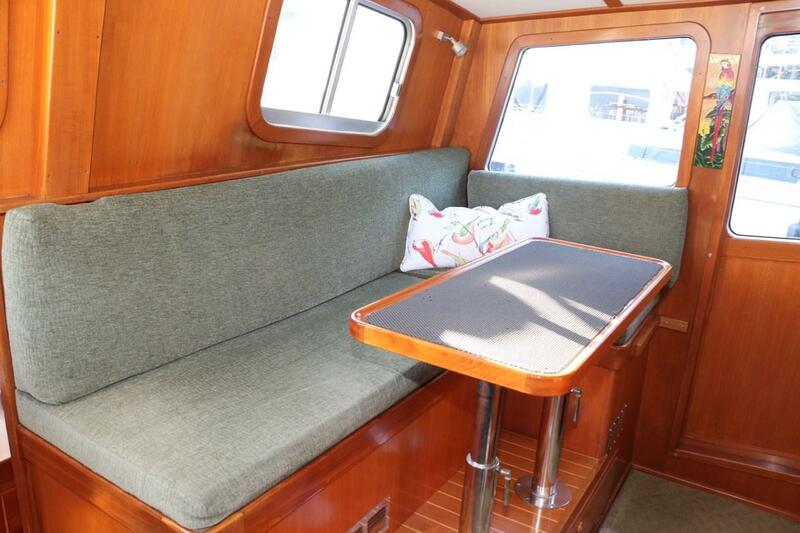 Up two steps to the pilothouse, the helm is to starboard, with a fold away helm seat, a chart table with storage below, and large bench settee with a table creates a social space while underway, and an ideal spot for a casual meal when at anchor. 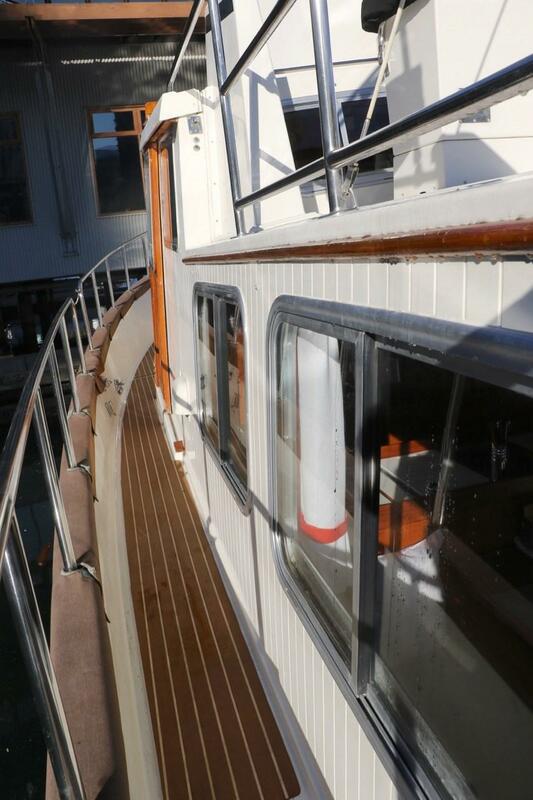 Two aft facing windows provide aft visibility for docking or when underway. 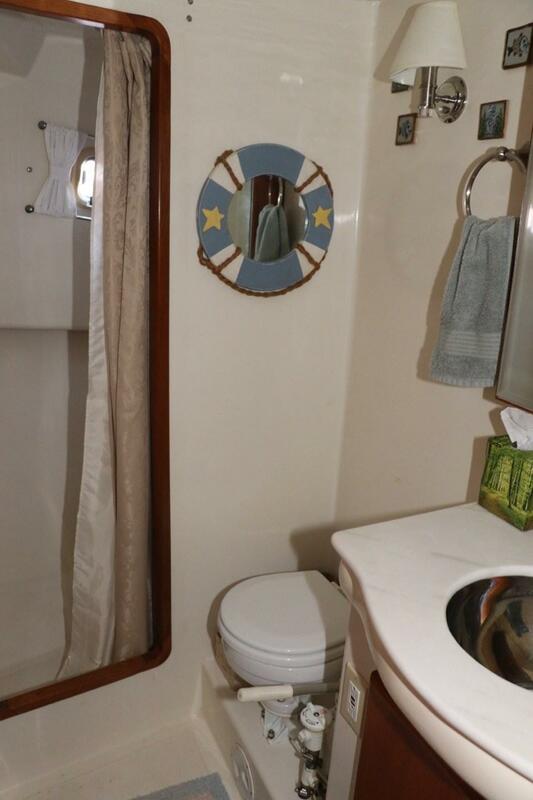 Down two steps to the forward cabin, starboard is the head with separate shower stall, and forward is the master featuring an island queen berth. 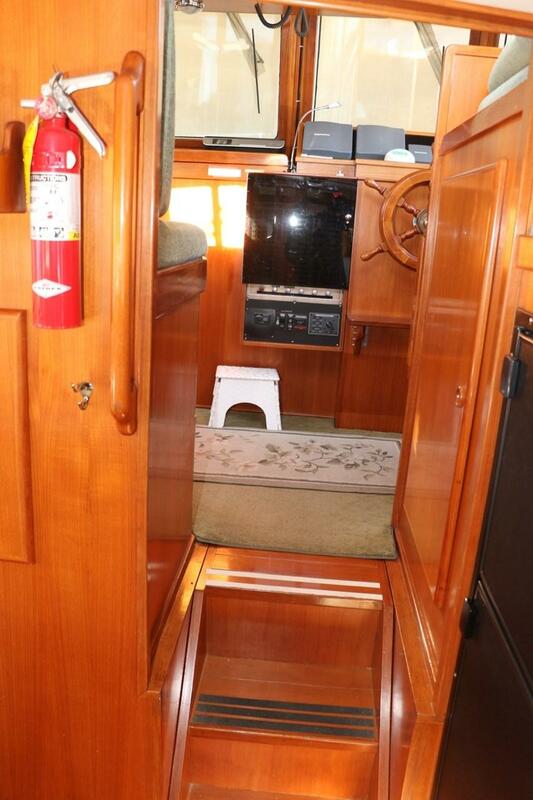 Note the two door lock off access to the head from both the companioneway and the master cabin for privacy. 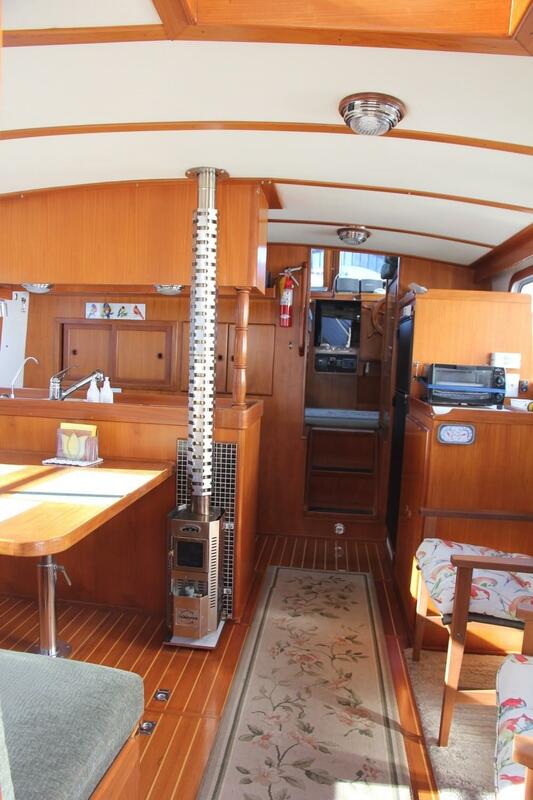 The engine room access is on the port side from hatches in the pilothouse, and on the starboard side by lifting the steps to the pilothouse - and there is good room for service work and engine checks. 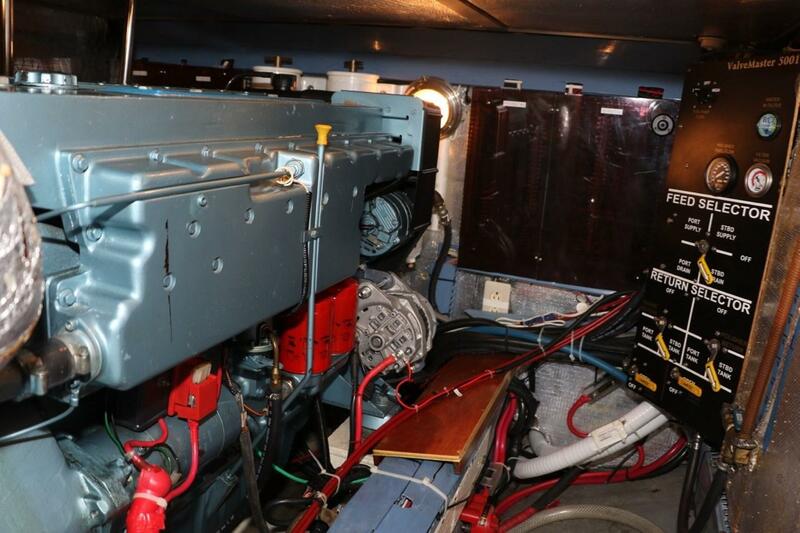 The generator and battery bank is located in the large cockpit lazarete. 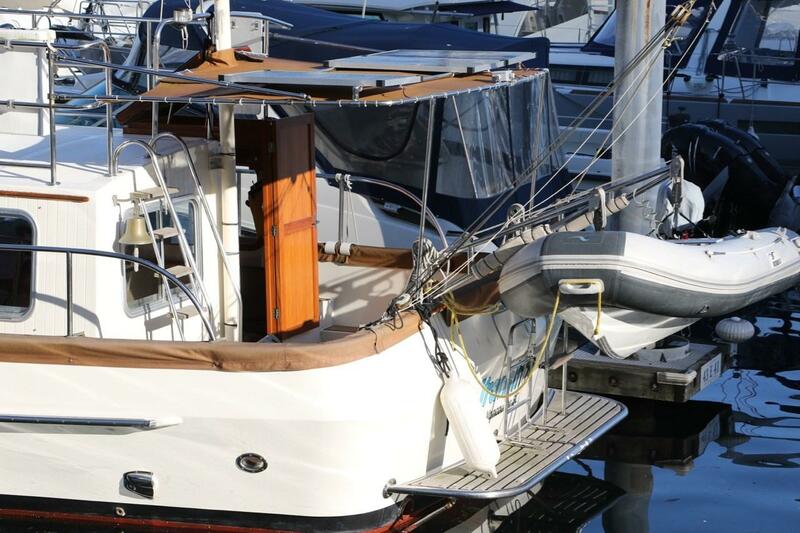 The flybridge is accessed by ladder from the cockpit. 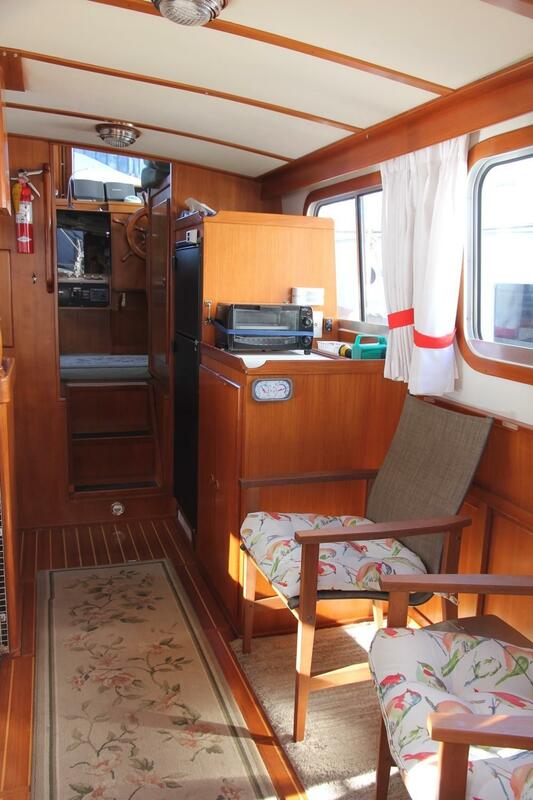 There is a bench seat at the helm, a bimini top, mast with lifting boom, open space behind the helm for lounging, and solar panels on top of the canvas cockpit canopy. 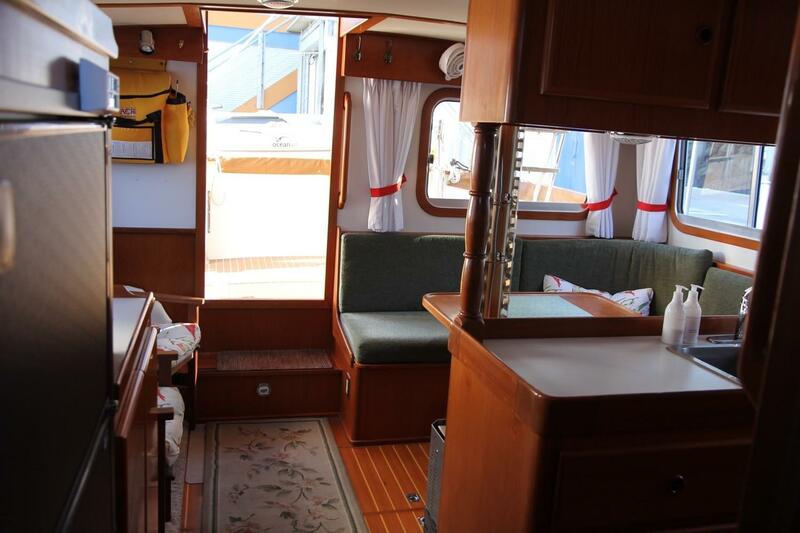 Hi there, I would like more information about the Eagle 40 Pilothouse Trawler.